S1. How can I install the HENNGE Secure Browser App successfully? If you wish to know how to install HENNGE Secure Browser on smart devices, please refer to “Setting Up HENNGE Secure Browser (Smartphone) “. S2. Can you download files or documents onto your devices through the “HENNGE Secure Browser”? When you attempt to download files onto your smart devices/laptops, you will find you will not be able to successfully download files. This is to prevent potentially virus-infected files been downloaded onto users’ devices; this also prevents sensitive company information from been saved on to users’ local machine. S3. Can you copy and paste the texts in the App? If you browse websites using the HENNGE Secure Browser, you will find that you are unable to copy or paste any texts. This is to prevent unintentional or intentional leakage of sensitive information of the company. S4. 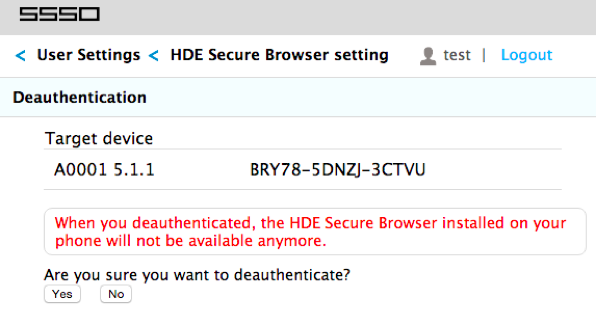 Will you be able to continue use the HENNGE Secure Browser App after the device has been deactivated? “No”, the device will not be able to connect. To deactivate your device, please login to your Access Control User Console, click on the “HENNGE Secure Browser settings” and delete the device authorization as shown below. You will find the confirmed message. You can attempt to use the App again, but you will find the App inaccessible. This feature allows users to disable the access rights of lost devices.